Playing with a Metronome/Click – it will change your life. If you don’t have your band playing with a metronome or click track, you most definitely should. We do, almost every song of every weekend. It was hard at first. I’ll give you that. It took us some getting used to, but once we did – oh the joy! There’s no longer a question of who was rushing what part, you can hear it. It’s kind of natural too. For a lot of our church musicians, playing to a click track is something they do all the time, they might just not realize it. But, when you’re playing along with a recording of a worship tune, chances are, you’re playing with a click track. We use the Tama Rhythm Watch. It’s a pretty good metronome for only 90 bucks. It’s not perfect. But you can store presets which is essential for using live. It’s got an output on it, so we run it into our aviom in ear monitors & it’s great. “That’s great,” you say, “but we don’t have fancy in-ear monitors like you new fangled churches.” That may be so, and there’s nothing wrong with that. (Though, in the future, I’ll talk about the advantages of that, if you don’t already know.) This one, has a little light on it, that your drummer could use. Or, you could give the drummer an ear piece to listen to the metronome. At the very least you ought to consider using one in your rehearsals. It will definitely help sharpen up your performances. 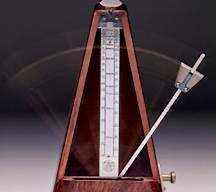 Playing with a metronome will really tighten the band up. I wasn’t a believer before we started trying it & made a commitment to stick to it. But now that we have, it makes a really big difference. Give yourself a few months, and you’ll be wanting to play with videos & loops. Of course if you go that route, Ableton Live has a click built right in, and it can do other cool things like sync guitar pedals & other MIDI/SMPTE devices. Below is a good self assessment to see where you are in terms of your ability to play with a click. The original post is here http://silverlakestudio.com/2010/05/guest-post-are-you-ready-to-record/ . Beginner – unable to stay with the click. The playing tempo lopes in and out of time as the player(s) first rush the beat, then compensate by slowing down. Advancing beginner – this is where the player is now able to follow the click accurately, but his playing has become stiff and constrained. All the focus is on following the click and not much is left to create a groove or musical feel. Accomplished – this is where the player or the band as a whole are able to follow the click precisely while maintaining an infectious and inviting rhythm. Advanced – at this level, the player has mastered all aspects of playing with the click and taken it to the level of an advanced skill, or art form. One of the most fascinating tricks I’ve seen studio musicians pull off in this realm is a thing I call the “tempo illusion.” Let’s say there’s a ritard in the middle of the song. By playing ever so slightly behind the click, while gradually playing more softly and using fewer notes and less rhythm –through the course of the ritard, these players create a tempo illusion that sounds exactly like a slowing of the tempo, but the tempo has actually not changed at all. When the click is removed, the listener would swear that the music has slowed down through the “fake” ritard. It’s a fascinating and inspiring thing to watch, and I hope readers might take this as a motivation to work hard on click skills.